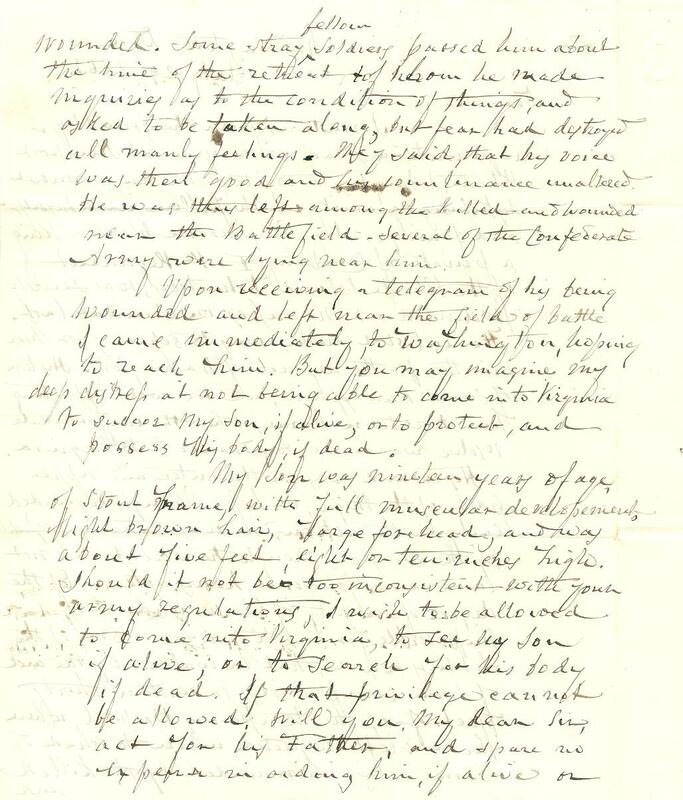 Item description: Letter, dated 29 July 1861, from David King, M.D., of Newport, R.I., to Col. William Porcher Miles, C.S.A., regarding the fate of his wounded son, Theodore Wheaton King, a private with Company F of the 1st Rhode Island Volunteer Infantry Regiment. In the letter, King encloses a recent photograph of his son, Theodore, with the hope that it will help identify him. 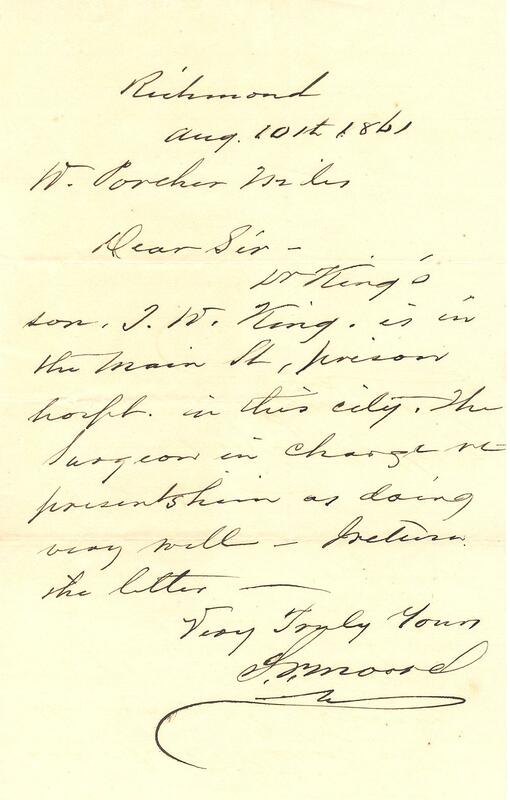 Following the letter is a message, dated 10 August 1861, from someone on the staff of a Richmond prison hospital, confirming Theodore Wheaton King’s whereabouts. It is not known if King survived his wound or the subsequent imprisonment at Richmond. Item citation: From folder 42 of the William Porcher Miles Papers #508, Southern Historical Collection, The Wilson Library, University of North Carolina at Chapel Hill. I venture from the friendly acquaintance I had with you at Newport Rhode Island to write you on a most distressing calamity which [fallen?] upon myself and family. 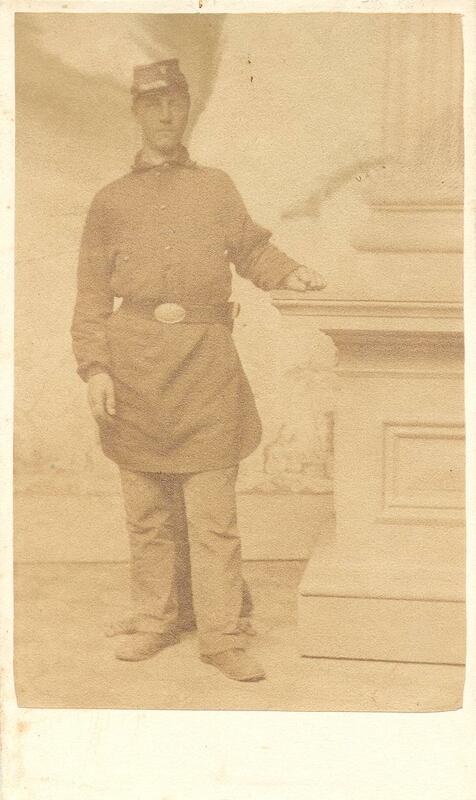 My son, Theodore Wheaton King a private of Company F 1st Regiment of the Rhode Island Volunteers, was severely wounded at Manassas on Sunday last. 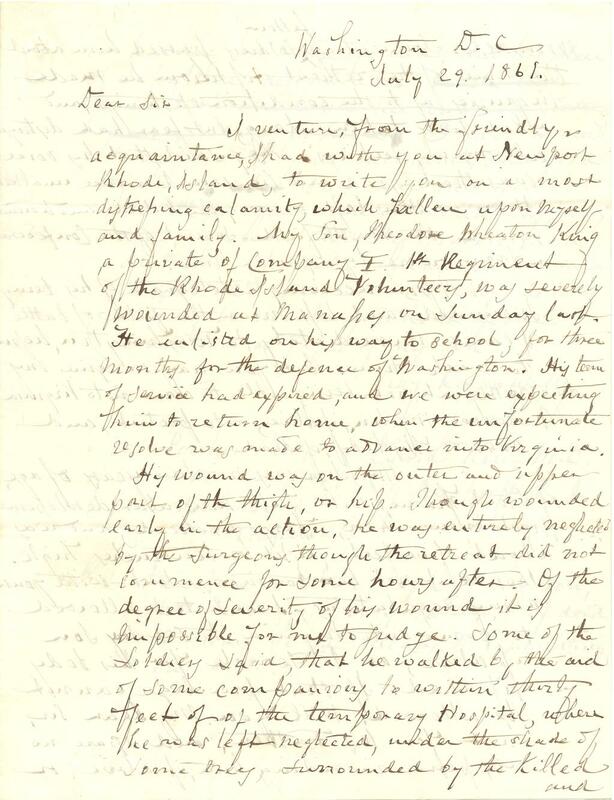 He enlisted on his way to school for three months for the defence of Washington. His term of service had expired, and we were expecting him to return home when the unfortunate resolve was made to advance into Virginia. His wound was on the outer and upper part of the thigh, or hip. Though wounded early in the action, he was entirely neglected by the surgeons though the retreat did not commence for some hours after. Of the degree of severity of his wound it is impossible for me to judge. Some of the soldiers said that he walked by the aid of some companions to within thirty feet of the temporary Hospital, where he was left neglected, under the shade of some trees surrounded by the killed and wounded. Some stray fellow soldiers passed him about the time of the retreat, to whom he made inquiries as to the condition of things and asked to be taken along, but fear had destroyed all manly feelings. They said that his voice was then good and his countenance unaltered. He was then left among the killed and wounded near the Battlefield–several of the Confederate Army were dying near him. Upon receiving a telegram of his being wounded and left near the field of battle I came immediately to Washington, hoping to reach him. But you may imagine my deep distress at not being able to come into Virginia to succor my son, if alive, or to protect, and possess his body, if dead. My son was nineteen years of age of stout frame, with full muscular development, light brown hair, large forehead, and was about five feet eight or ten inches high. Should it not be too inconsistent with your army regulations, I wish to be allowed to come into Virginia to see my son if alive, or to search for his body if dead. If that privilege cannot be allowed, will you, my dear sir, act for his Father, and spare no expense in aiding him, if alive or in having his body found, and his place of departure designated. In the last case, I should like his hat and clothes preserved, if possible. I have no need to appeal to your humanity, and good feelings. I am sure that you will do all in your power to aid my family they, overwhelmed by sorrow and distress. I shall remain in Washington at 486 12th Street at Mr. CB King’s as long as may be necessary to hear of the condition or fate of my son. P.S. I enclose a photograph of my son, though very poorly taken. If dead it may be the means of designating his body. Dr. King’s son, T.W. King, is in the main [St?] prison hospt. in this city. 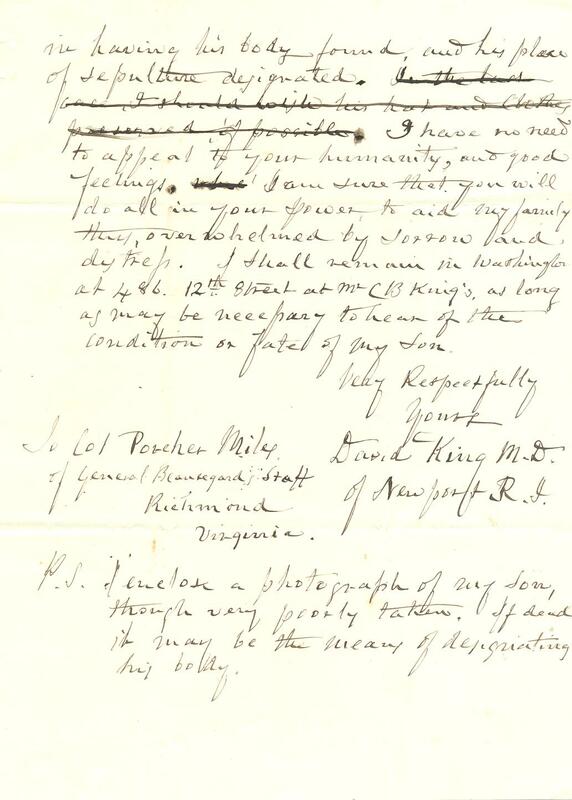 The surgeon in charge represents him as doing very well– I return the letter. This entry was posted in Southern Historical Collection and tagged 1st Regiment of the Rhode Island Volunteers, casualties, David King, First Battle of Bull Run, First Battle of Manassas, photographs, prisoners-of-war, Rhode Island, Theodore Wheaton King, William Porcher Miles. Bookmark the permalink.